Quality Personalized Egyptian cartouche rings and Egyptian jewelry customized with your name in hieroglyphics. Our 18k Gold Queen Cleopatra's Cartouche Ring is Handmade in Egypt. 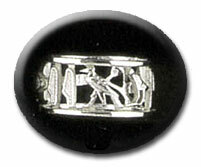 The 18k gold ring has Cleopatra in Hieroglyphics. The Egyptian handmade silver ankh ring with scarab - The Ankh represents living & everlasting life, not only in the material world but in the spiritual afterlife, & is the oldest and most sacred Egyptian amulet. The Egyptian ankh ring silver 4 ankhs The Egyptian silver ankh ring The Ankh represents living & everlasting life, not only in the material world but in the spiritual afterlife, & is the oldest and most sacred Egyptian amulet. The Egyptian 18k gold ankh ring The Ankh represents living & everlasting life, not only in the material world but in the spiritual afterlife, & is the oldest and most sacred Egyptian amulet.